Our ministry’s purpose is to engage young people in the vibrant life of the Catholic Faith and to form lifelong disciples of Christ and His Church. 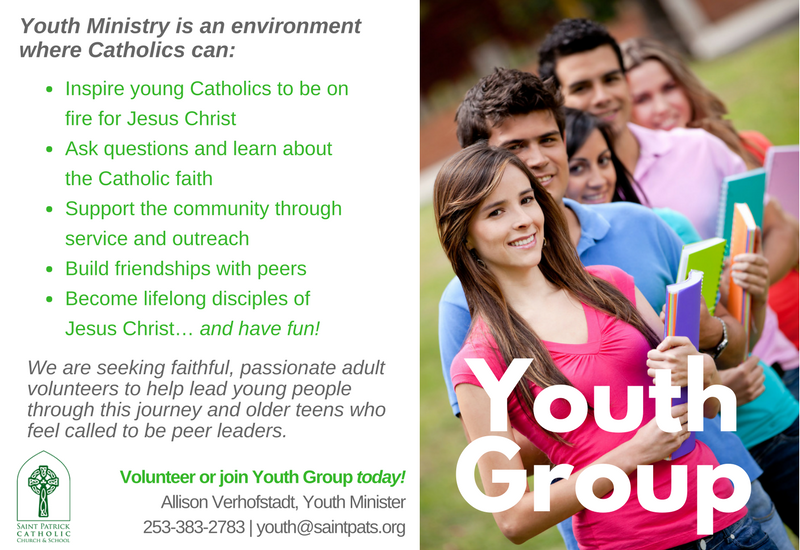 Youth Group is a ministry for students in grades 6-12. It provides the opportunity for youth to come together and discuss their faith, as well as to serve their community in powerful ways. 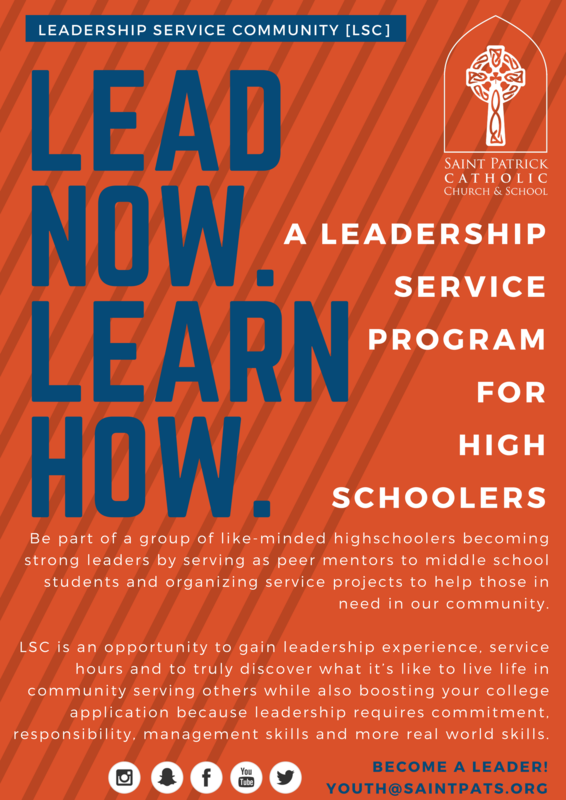 Our youth group will also raise up peer leaders who will be older high school students that are ready to take on a leadership role in youth ministry. Youth explore their faith through games, discussion and small groups. Students socialize, share in a meal or snacks while learning about the faith and praying as a community. 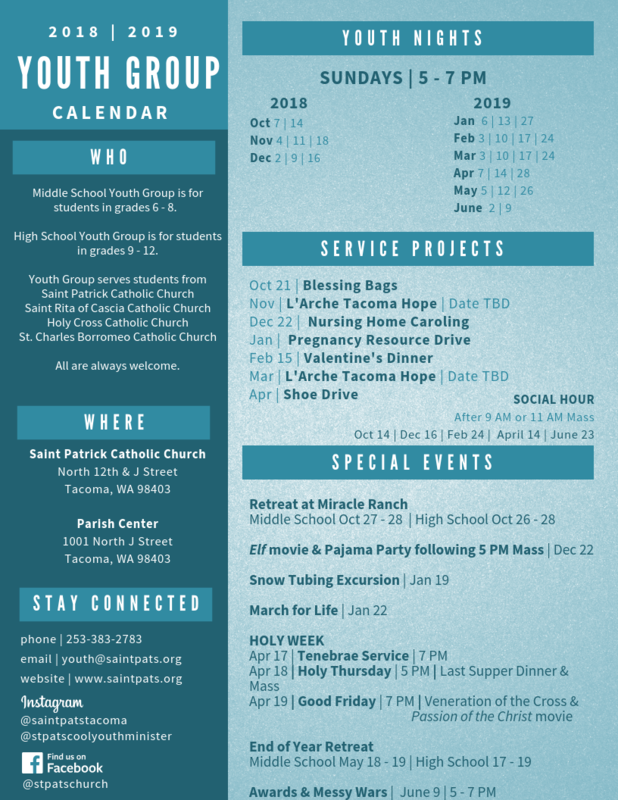 Throughout the year, the Youth Ministry hosts several retreats focusing on strengthening relationships with Christ, His Church, and with each other. Service projects are also a large part of youth group and taking our faith to the streets to spread the gospel message, leading by example. To raise up high school students to become leaders in their personal community through their teaching as peer mentors to younger grades as well as in their greater communities by organizing service projects to help the needy. Once a month leadership formation meeting, at least 3 youth nights a month, and one service project a month. Attend one retreat a year and plan one retreat per year. Participation in the 300/4US events as well as Ignite Your Torch strongly encouraged! Serve as a leader for middle school/junior high youth groups, helping to facilitate icebreakers, participate in skits or give witness talks. Lead a small group of teens through discussion questions and lead prayer. Do their best to grow in their own personal faith through mentorship with their youth leader, discussions with their fellow leaders, or private reading. Attend one formational retreat and help to plan as well as execute one middle school retreat per year. Help to organize outreach projects for the middle school youth groups that unite high schoolers and middle schoolers. Be part of a group of like-minded teenagers who are walk together throughout the high school years and support and pray for each other. A community that feels safe and comfortable to talk about the things going on in life and receive helpful advice or compassionate empathy. A place to ask questions about the faith and have them answered in a thorough and personal way. A chance to have one-on-one time and a true mentorship with your youth minister to help guide you as a leader both in your faith and personal life. A way to pass on the faith to those younger than you, to help middle schoolers through their junior high years and to become a role model for them. An opportunity to gain service experience, service hours, and to truly discover what it’s like to live life with a servants heart. A program that will speak volumes on a college application because of the obvious commitment, responsibility, and time management required to participate. I want to be part of Youth Ministry!